From sculptor Joe Broers, who brought us Cthulhu as drawn by H.P. Lovecraft, comes The Music of Erich Zann. Erich Zann is $79. Postage is $11.35 if you are in the United States. If you are not, then international postage is $25 for First Class or $40 for Priority. ORDER “ERICH ZANN” – UNITED STATES . 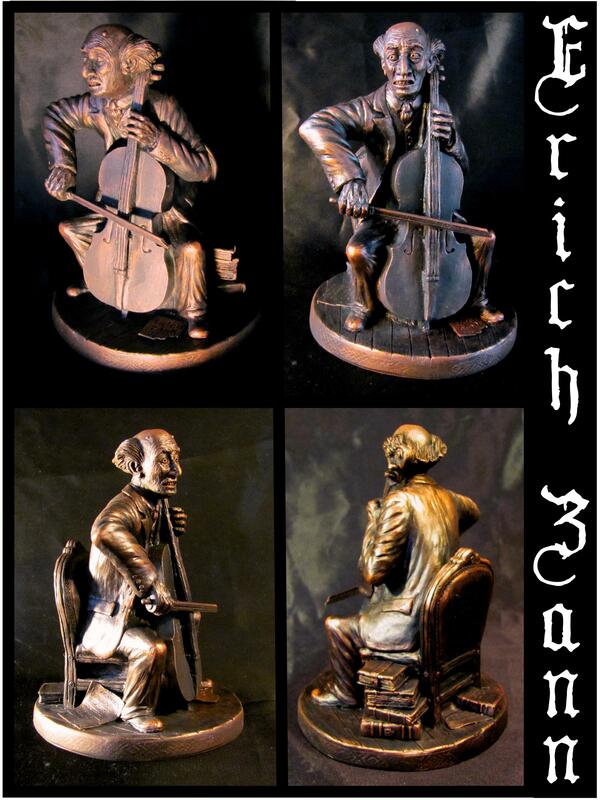 ORDER “ERICH ZANN” – INTERNATIONAL – FIRST CLASS SHIPPING. ORDER “ERICH ZANN” – INTERNATIONAL – PRIORITY SHIPPING. I want all these sculptures but I swore to myself I would not get into Cthulhu knick-knacks, and my wife would hate them, but you, sir, are making this very difficult! Not to quibble or anything, but Erich Zann played a violin! The story actually says ‘viol’, which is what I attempted to sculpt, but I wonder if people didn’t just read ‘viol’ as violin? The illustration for the first Weird Tales publication of the story in 1925 got it right, but looking around it seems that almost no one else did after that. “Viol” can refer to a family of instruments – another of HPL’s archaisms. I first read this story when I was 11 and I am now almost 70. This sculpture is just as I have always pictured the subject.